Dermarolling / Microneedling / Re: Skin Product Schedule? Thank you for your compliment on our website! You do not have to avoid creams but buy creams that are a bit heavier – they contain fats to make the protective film on the skin that prevents the evaporation of water from the skin. Wet a cotton pad with a little tap water, sprinkle it with almond oil and clean your face with it. It will leave the skin nice, moisturized and supple. If you have dry skin on the body, apply a little almond oil all over the skin while your skin is still wet from the shower. Yes, it is a sensible routine but if the skin stays red and sensitive for a long time after dermarolling with the 0.5 mm reduce the frequency with the 0.5 mm. The more is not always the better. Dermarolling / Microneedling / Re: dermaroller or dermastamp for scars? It especially applies to the dermastamp with 35 needles. We also sell now a dermastamp with 80 needles. I recommend a 1.5 mm dermastamp with 35 needles and the 0.1 % Tretinoin cream (we sell it). The scar will get red after stamping and Tretinoin will also make it temporarily red but it will diminish the redness of the scar eventually. Stamp it densely every three weeks and apply Tretinoin every second day. Dermarolling / Microneedling / Re: What to apply after dermaneedling acne scars with 1.5 mm? Almond oil is usually for sale in pharmacies (as massage oil for example). You can also buy almond oil intended for cooking. The advantage of almond oil is that it penetrates into the skin and doesn't leave a heavy greasy layer on the skin (just a little feeling of oiliness). You can very easily buy it online. They will be very cheap (5 for $9 dollars). I just wanted to show everyone that we are working hard on getting the new single needles designed and produced. This is the approximate shape. We are working on making the needle handle more comfortably now, so the design isn't final yet. It will be ready somewhere in January 2013 unfortunately. This really is a major project for us. $5000,- for the mold and initial design, $15000,- for an initial order, and that excludes shipping and customs fees. All in all a $25000,- project but we will then be the only vendor with a single needle to perfectly treat many skin problems with. Our previous single needle did not stop exactly at the depth it had to - this one will. Where do you have the scars? Are they raised or indented? How large is the scarred area? Oh boy.. Some of the cups posted in the image in this thread areway too large to be used on the skin, severe bruising will result. This is why the suction cups that we're selling (since today!) are smaller. Treatment takes longer, but severe bruising such as this can be avoided. The good news is that the bruising from the suction may enhance the efficacy of microneedling. Waiting six weeks is enough. Unless it takes really a long time for the bruises to subside. How long do you stay red like this? If you feel uncomfortable walking around with such large red area, stamp and suction a smaller area during your session. As soon as it heals, stamp and suction another small area. Use a 2 mm dermastamp (the skin is thick in that area) and apply 0.1% Tretinoin cream right afterwards (we sell it) to help remove the hardened collagen scar tissue. You do not have to insert the full length of the needles. First concentrate on the surface of the scar, later go deeper. If the 2 mm size scares you, buy a 1.5 mm dermastamp. It will probably be enough. You do not need the vit. C or copper peptides. Keep the stamped area moisturized. Apply Tretinoin and then something moisturizing on top of it. Preferably some oil. Just a little is enough. You can also buy our Infadolan ointment for stamping afercare. Dermarolling / Microneedling / Re: Recommended dermarolling for acne scarring? Deathfalcon, please let me think about your case for a while. This one is hard. 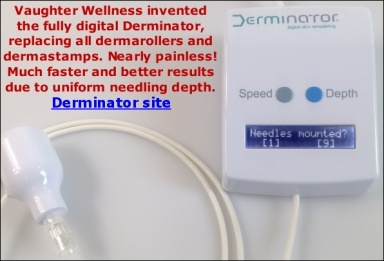 Dermarolling / Microneedling / Re: Why don't you sell a 3-liner (narrow) 1 mm dermaroller? I suggest you use a 1 mm dermastamp. It is effective and easy to maneuver in this area. The area around the lips is very sensitive and you may need a numbing cream. Even with a 1 mm size. A dermastamp is less painful than a dermaroller but it is more laborious. We do not sell the narrow 1 mm roller because I usually advise a 1.5 mm size for the wrinkles around the lips. These wrinkles are quite "stubborn". A 1mm size is however also OK.
Elizabethrose13, wait with the Tazorac until the next day. It would be too irritating. I only recommend applying Retinoids right after dermarolling in case of scars with hardened collagen bundes such as stretch marks, surgery and scars due to an accident etc. Not your case. Lagale, your scars do not seem to be really deep but you have some hypopigmented scar tissue inside them. First single needle it (to crush the hardened scars tissue) and then (in the same session), stamp it with your 1.5 mm dermastamp. Deathfalcon, can you please tell me (if you know) when did your skin turned like this (is it post acne? ), how was your skin before and whether you have already undergone any skin procedures? Dermarolling / Microneedling / Re: home dermarolling/needling or professional treatment for SCARS? Yes, it is OK but we are currently sold out. We made a new design for our needles and they are being produced but it unfortunately takes a long time. The needle itself will be the same (very thin long taper) but the holder is going to be shorter and thicker to make it easier to hold it. There really are no alternatives, since our new needle stops exactly at 1.8 mm penetration depth and no other needle does that, which is very important to avoid (really quite terrible) bruising. The reason we have such a big delay in needle production is that a previous factory wasted more than half a year of our time. The current factory is much more professional, and is on schedule.